The government plans to bolster non-oil exports. But for that it needs to act on a war footing to arrest the fall in some of India's biggest exporting sectors. Thousands of workers in diamond cutting and polishing units of Surat and Bhavnagar, Gujarat, got about 45 days leave for Diwali this year instead of the 10-15 days that used to be the norm during the festival season. The majority of the 20,000-plus units in these export hubs shut operations a month before Diwali and are yet to start operating at full scale. The extended holiday in the gems and jewellery sector could prove to be a nightmare for India's Commerce Minister Suresh Prabhu as it shows sluggish growth, a headache for his ministry, which oversees the country's external trade. "It was a longer holiday this time, but if the situation worsens, some of the SMEs may close down," says Praveen Shankar Pandya, promoter of Mumbai-based Revashankar Gems Ltd. Such pessimism is not specific to the gems and jewellery industry. In fact, several export-focused sectors such as readymade garments, leather and meat products and marine products continue to register tepid or negative growth. These gaps in India's export story are so glaring that they take the sheen off one of the biggest claims of the Narendra Modi government - recovery of exports. Statistically, there is merit in its claim that India's merchandise exports have reversed years of fall. Merchandise exports, after all, expanded 10 per cent in 2017/18. But one of the key drivers of this growth was rise in global oil prices, as a major segment that grew well above the average at 8.6 per cent was value-added petroleum products. Petroleum product exports, at $38.4 billion, accounted for 12.7 per cent of India's total goods exports worth $303.5 billion. The continuing rise in petroleum prices has seen the share of petroleum product exports (worth $20.6 billion) increase further to 15.2 per cent during April-August 2018. Other sectors like chemicals and engineering goods also contributed, though its performance looks better due to the low base of the previous year and rupee fall, which increased the price competitiveness of some products. Structural issues continue to plague even sectors that are seemingly going strong. Ravi Seghal, Chairman of the Engineering Exports Promotion Council of India, attributes the growth in Indian exports (in October, exports grew about 18 per cent to $26.98 billion) to low base and cautions that the global economic landscape is facing several headwinds, including protectionism by some major economies and an uncertain and complicated Brexit being negotiated between the UK and the EU. "Despite the sharp drop in crude oil prices, there is no stability in energy prices. The key lies in improving our domestic turf by reducing our cost of manufacturing and shipping as well as interest rates," he says. Increasing protectionism in key export markets like the US, looming trade war between countries and trade blocks, trade sanctions and tariff restrictions announced by the US against China, Iran and others, and projected weak growth in world economy are all negative for India's export growth. So are the country's own infrastructure bottlenecks, policy gaps, regulatory hurdles, teething troubles of the Goods and Services Tax (GST) and the (now fading) impact of demonetisation. These factors have ensured that even with rupee depreciating against the dollar in recent times, merchandise export earnings are yet to cross the $313 billion mark they had clocked in 2013/14 during the previous governments tenure. To his credit, Prabhu's ministry has undertaken a series of measures, including implementing country- and product-specific strategies. "We have a dash board. We monitor it (progress of export-friendly measures taken by each department or ministry) on a day-to-day basis," he says. But are his plans working? A closer look at some sectors that contribute close to half of India's merchandise exports - engineering goods (26 per cent), gems & jewellery (14 per cent), apparels and clothing (6 per cent), livestock and hide (2 per cent) - will shed more light on issues worrying businesses. Call it the Nirav Modi/Mehul Choksi effect. The alleged frauds committed by these fugitive diamond businessmen have left a trail of distrust that is haunting the gems and jewellery sector, a predominantly small and medium scale industry that contributed $41.7 billion, or close to 14 per cent, to India's merchandise exports in 2017/18. The sector, which employs over 4.64 million workers, is facing one of its biggest liquidity crisis after banks started tightening financing more than a year ago. Exports from the sector shrunk 4.3 per cent in 2017/18. They further fell 2.82 per cent in the April-September period of the current financial year. "The diamond industry grew largely because of the financing the government of India provided from 1970s & 80s. We developed a hub of small diamond polishing. From nowhere, we grew to $22 billion in diamonds alone. Unfortunately, we have been losing ground lately," says Pandya. What is troubling the industry is the Reserve Bank of India's directive for tightening of lending norms to reduce the risk of non-performing assets. SME credit ratings are not often the highest and the need for 150 per cent collateral is more than what SMEs can afford. Banks are even refusing to discount bills if the repayment date exceeds the 30-day deadline stipulated as part of the fresh RBI directives. "Business happens in its own way. If my customer is buying $4 million worth of stuff from me and says he cannot pay now and needs time, you have to give him time. Otherwise, he will go to my competition," says Pandya. The new guidelines have ended this flexibility. Industry players are opting to reduce transaction volumes than going for financing to keep pace. "We estimate that the industry has lost 25-30 per cent of its finances already. In another year, it will lose 10-15 per cent more. It is happening at a time when competition is building up, markets are slowing down and the need to have a bigger inventory is at its peak," says Pandya. India does not have either raw material or market when it comes to diamonds. Only 5 per cent of the stones polished here are sold in India. The rest are exported to over 80 countries. India can ill afford to cede its leadership position. If the diamond industry is about imported raw material being exported after value addition, India's leather and leather product and meat export sectors find strength in the country's livestock population. But ample raw material availability is not resulting in corresponding export growth. India's leather and leather product exports, worth about $7 billion in 2017/18, and meat exports of another $3.5 billion, are both struggling to grow. "Any campaign against slaughter, hides is going to affect the image of the leather industry. There is no ban on use of animal hides, but once panic sets in, it will have an adverse impact on growth," says Rafeeque Ahmed, Chairperson of Farida Group, a Chennai-based leather shoe maker. However, sensitive anti-slaughter slogans are just one of the several factors that are pulling down leather exports. "Internationally, there is a slowdown. Fierce global competition is also a reason. While the largest Indian company can produce 7,000 to 10,000 pairs of leather shoes a day, in Vietnam or China, it is 70,000 to 100,000 pairs. Economies of scale matters. We have to build capacities," says Ahmed. India's leather product exports declined 2.96 per cent during the April-September 2018 period. They had grown 2.4 per cent last year. Ahmed says recent sops to incentivise opening of new factories and buying of machines will have a positive impact on the sector but over a long term. Fauzan Alavi, spokesperson for the All India Livestock Exporters Association and a director of India's largest meat exporter, Allanasons, says government policy to incentivise leather exporters by discouraging hide exports (there is 60 per cent duty on export of raw salted buffalo hide) is making the meat export industry non-competitive. Negative campaigns within the country, market access issues and devaluation of currencies of key competitors are adding to its woes. "Australia and Brazil are our biggest competitors. Their currencies have fallen sharply over a period. Earlier, the difference between Indian and their meat used to be at least $500 to $700 per tonne. Now, it is $150 to $200 a tonne. Further, we cannot export raw hide as steep export duty makes it non-competitive," says Alavi. According to him, the industry was not keen on export of byproducts earlier as the core meat business was stable. "In the last two three years, our business has been really sinking, and currency devaluation is playing a major role in our survival internationally. We have been running from pillar to post right from the commerce minister to the finance minister to remove this duty. Nothing has happened," he adds. 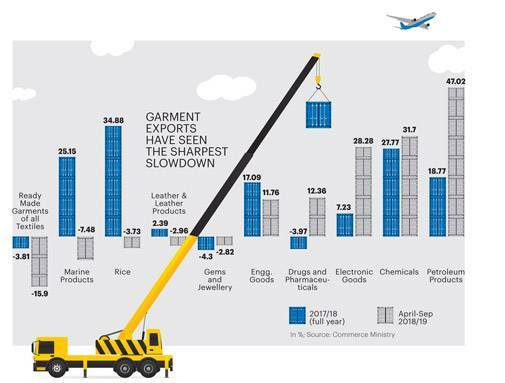 If there is one area where export growth has been on a continuous decline, it is the apparels and garment export sector. The fall was 3.81 per cent in 2017/18 and 15.9 per cent in the first half of the current year. "We are not as competitive as Bangladesh, Cambodia, Vietnam. China is getting expensive of late, but it has massive capacities and very high productivity. We are losing markets. 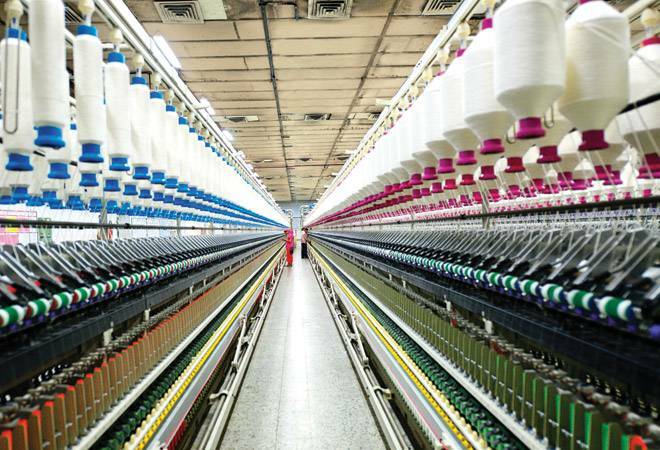 Buyers shift to other countries even if they lose a few cents," says HKL Magu, Managing Partner of Delhi-based Jyoti Apparels and Chairman of the Apparel Export Promotion Council. "The main issue is price. Our infrastructure is also poor. Buyers look forward to fast deliveries. If I place an order for 1,00,000 metres with any mill, first it will increase the price, and delivery will happen in 30 days or 45 days. In China, if somebody places an order for even one million pieces, they have that much productivity and stocks that the mills are ready to deliver." Another reason for fall in textile exports is that competing countries have better market access due to free trade agreements, or FTAs, with key markets like the European Union. Magu says issues of delay in GST refunds have been sorted out but reduced rate of duty drawback is an issue. He adds the industry is unable to gain from rupee devaluation as the market factors in these corrections instantly. "The demand is not slowing down. The terms are altering. World over you see changes in what buyers are asking and at what prices. Whoever is transforming faster is doing well," says Rajinder Gupta, Chairman of TRIDENT Group, a major exporter of home textiles. 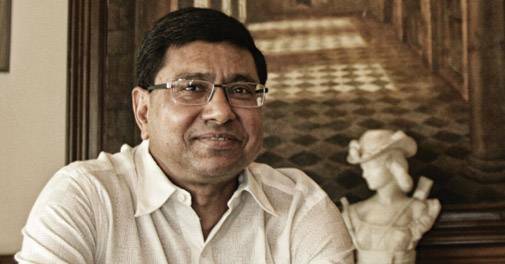 Kolkata-based Sanjay Budhia, Managing Director of Patton Group, says even areas such as engineering from where are exports are growing need support. Engineering exports had grown 16.8 per cent last year and accounted for 26 per cent of the total. With about 12 per cent growth from April till September this year, the sector is going strong even now. "However, in the last one year, prices of steel have risen almost 36 per cent. This has made engineering exports uncompetitive," says Budhia. According to him, mills export steel at much less than domestic prices. "Engineering exporters buy steel domestically at high prices. Engineering exporters should be provided steel at competitive or export prices that are offered to international buyers," he says. Budhia, also the chairman of industry chamber CII's National Committee on Exports and Imports, wants the government to continue the incentives it offers to existing special economic zones, or SEZs, as mid-term policy changes have turned many units in SEZs unviable. "A lot of infrastructure development and investments initially planned for SEZs have either been abandoned or suspended. The government should use this infrastructure for exports," he says. Alok Chaturvedi, Directorate General of Foreign Trade (DGFT), would want us to believe that the domestic situation is not that bad. The problems exporters are facing are mostly external, he says. Even for the domestic issues, the government has done its best, he says. "In the first six months of 2018/19, merchandise exports have risen 12.54 per cent to $164 billion. If petroleum prices remain high, we can hope to achieve $330-340 billion this year," he says. In a recent presentation to exporters, Chaturvedi said the commerce ministry had already taken the initiative for formation of a sectoral export strategy. "Three meetings have been held by the minister with secretaries of key exporting ministries. Sectoral strategies have been finalised, a matrix of specific action points, sector wise, has been made and is being monitored for results in a very short time," he says. The ministry has also finalised a strategy to generate $114.8 billion worth of additional revenues from export of 685 products in the next two-and-a-half years. The government is also planning to incentivise exporters who are at a disadvantage with respect to competing countries though some FTA-type arrangements with destination markets. "We are also trying to find solutions for specific products in specific markets to partially compensate the disadvantages the exporters are facing," says Chaturvedi. Incidentally, commodity specific strategies are in place for sectors like gems and jewellery, leather, textile & apparel, engineering, electronics, chemicals and petrochemicals, pharmaceuticals, agri and allied products and marine products. 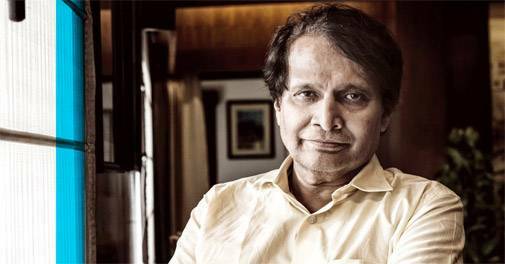 Commerce Minister Suresh Prabhu calls the rise in Indias exports in the last one year exceptional and says it should be seen in the light of a huge decline in the previous years as well as a global slowdown in exports. "I want India's exports to drive its growth story. And for that to happen, there has to be a partnership. I am ready to build partnerships with line ministries, state governments and industry. I must be talking to 10 to 15 important people globally every day on this issue. I believe this is the best opportunity, because when there is disruption in established global order, a country like India should take advantage of it and move ahead," he says. Industry is also awaiting such a partnership.